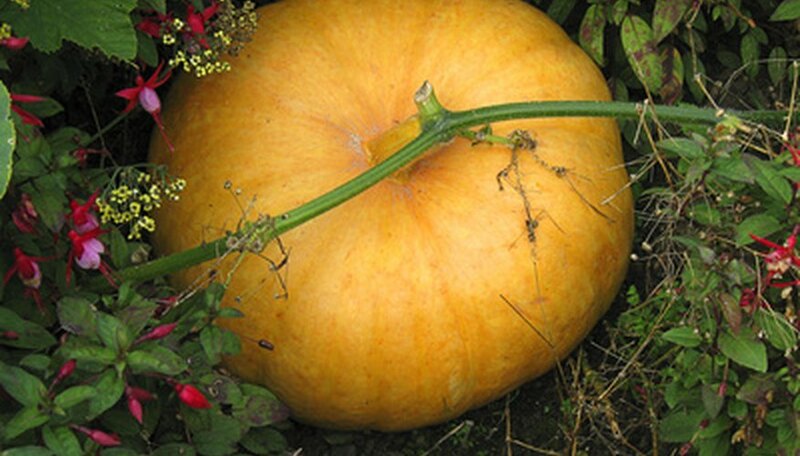 Pumpkin should not only be used for pies. Prepare this creamy, comforting Austrian pumpkin soup enhanced with the richness of pumpkin seed oil, a product born in Austria. Not only does the oil add a slight nuttiness to the flavor of the dish, but according to Stefan Aschan, writing for the Huffington Post, pumpkin seed oil contains healthy unsaturated fats, fatty acids, antioxidants and vitamins. Look for this specialty oil in international markets and on the Internet. Your soup will not taste the same without it. Cut the pumpkin in half and scoop out the seeds with the spoon. Rinse the seeds in the colander to remove attached pumpkin flesh or strings and pat dry with paper towels. Heat the oven to 350 degrees Fahrenheit, and scatter the pumpkin seeds onto the baking sheet. Cut the peel off the pumpkin and coarsely chop the pumpkin flesh. Fill a soup pot halfway with water and the pumpkin and bring to a boil over medium high heat. Boil the pumpkin until tender, about 30 minutes, and drain the pumpkin through the colander. Put the baking sheet with the pumpkin seeds on it into the oven to toast the seeds for 20 to 30 minutes or until golden brown and fragrant. Heat the butter and diced onion in the bottom of the soup pot over medium heat for 5 minutes or until the onion becomes soft and translucent. Puree the drained pumpkin chunks in a blender with 1 cup of the vegetable or chicken broth. Add the pumpkin puree, white wine, remaining broth, cream and nutmeg to the soup pot with the onions and reduce the heat to low. Slowly simmer the soup over low heat until thickened and warmed through, about 20 to 30 minutes. Serve the soup in four to six individual bowls with a drizzle of pumpkin seed oil and a spoonful of toasted pumpkin seeds topping each bowl as a garnish and for additional flavor. Save time by using two 14-oz. cans of pumpkin puree to substitute for the pumpkin in this recipe. Add the pumpkin puree, 3 cups broth, wine and cream to the soup pot with the onions. Omit the toasted pumpkin seeds as a topping or purchase commercially prepared seeds.